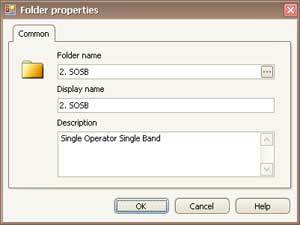 Basis of placing of members log files of participants is structure of folders freely created by the user. Very important correctly to plan and create structure of folders (categories) of participants before you begin to add in them reports. The basic idea: "Folder" is "Scores table". Folders it is a way of grouping of members files of participants. At processing of the files (addition of points) all qso-records being in the file placed in a folder are used. 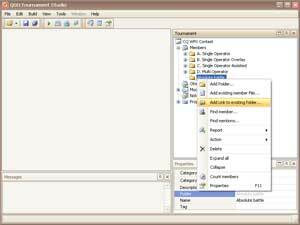 The group (category) of members on which the separate standings (separate reports) should be formed, should be presented in the form of a folder and contain all members files declared in this test category. Folders can be enclosed each other. 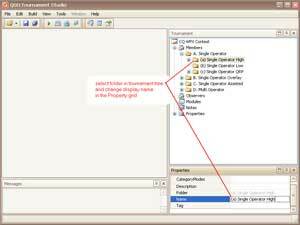 The premise of a member file in a folder always creates a copy of an initial file in the specified folder of competition. 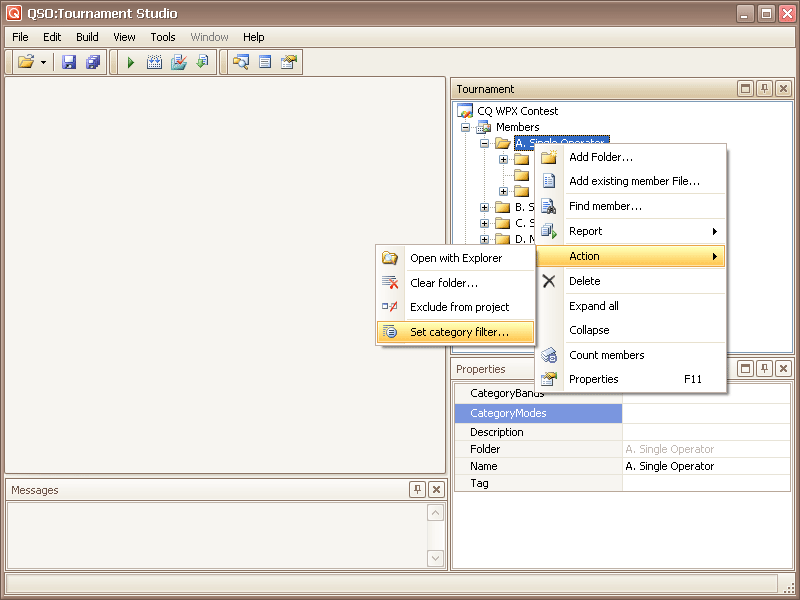 The member file lying in several different folders are different files, changes of one of them in any way do not mention contents of the others. One file can be put in any quantity of folders. For the participants who have sent the files only for check of communications of other participants (files not participating in competition) it is necessary to create a separate folder (to name it it is possible, for example, "CheckLog"), and to put in it these files. Click the right button of the mouse on tree node of competition in which it is necessary to create a folder (it can be node "Members" - root node of placing of files, or already existing folder). 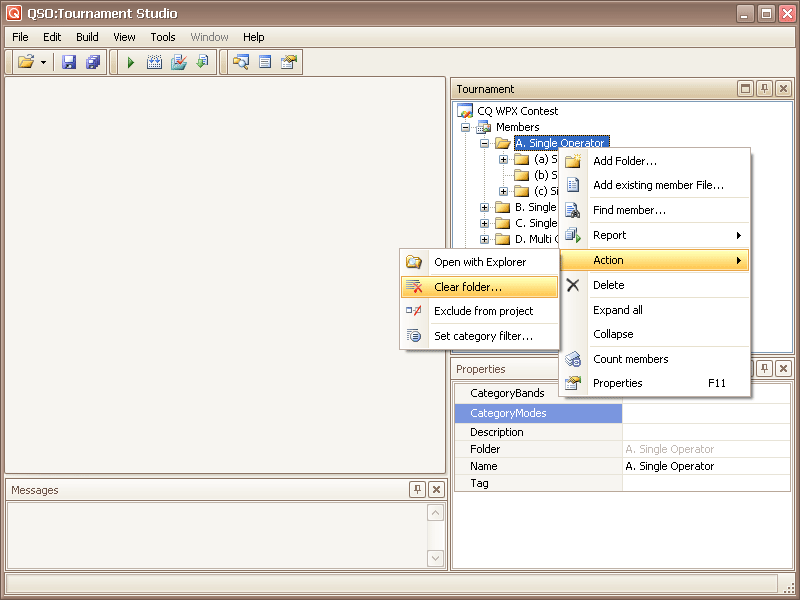 There will be a context menu in which it is necessary to choose "Add Folder...". 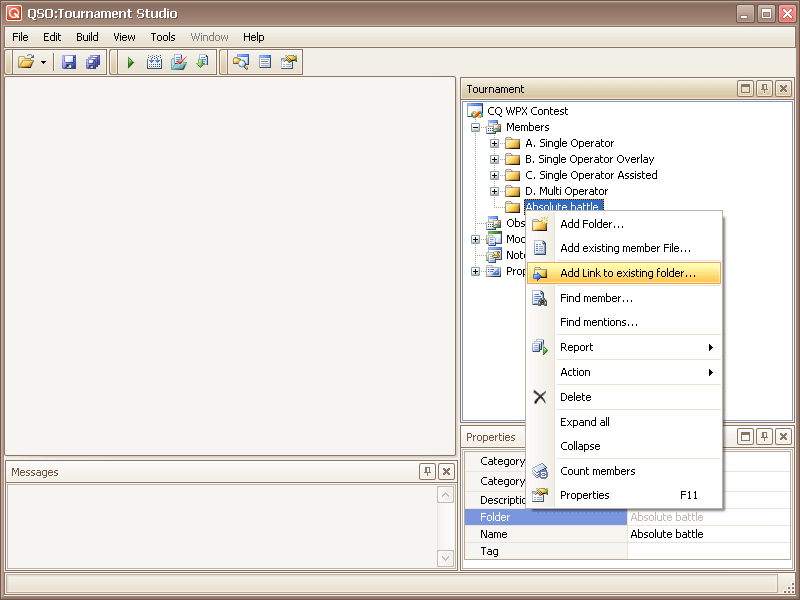 In the form of creation of a new folder in which it is necessary to specify: "Folder Name" - a valid folder name (should meet requirements to a folder name in file system, not contain inadmissible symbols), "Display name" - the name under which the folder is displayed in a tournament tree (can differ from a folder name). The displayed name and the description can be changed further. 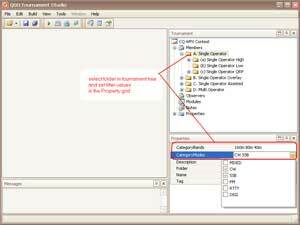 Select folder and change name in Property grid. Click the right button of the mouse on a folder which should be removed. There will be a context menu in which it is necessary to choose point to "Delete". ATTENTION! After acknowledgement of operation the folder with all its contents will be irrevocably removed from competition and from a disk. Application of operation of removal to root node "Members" deletes all folders of tournament. 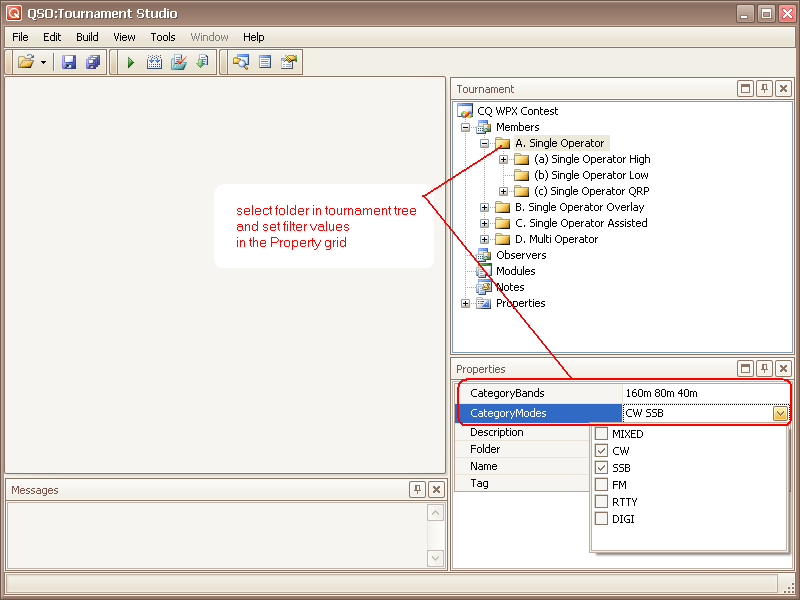 To create and delete folders of competition and to place in them members files it is possible only program means. Changes in structure of folders (files) brought out of the program (for example means of the file processor) in a competition tree are not reflected and cause infringement of structure of competition. If other is not specified, offset joins all records QSO from a file of the participant (all records participate in an addition of points). However the situation when the participant sends a file containing is possible, for example, records CW and SSB but wishes to be declared only in a subgroup "CW" (other records are CheckLog). 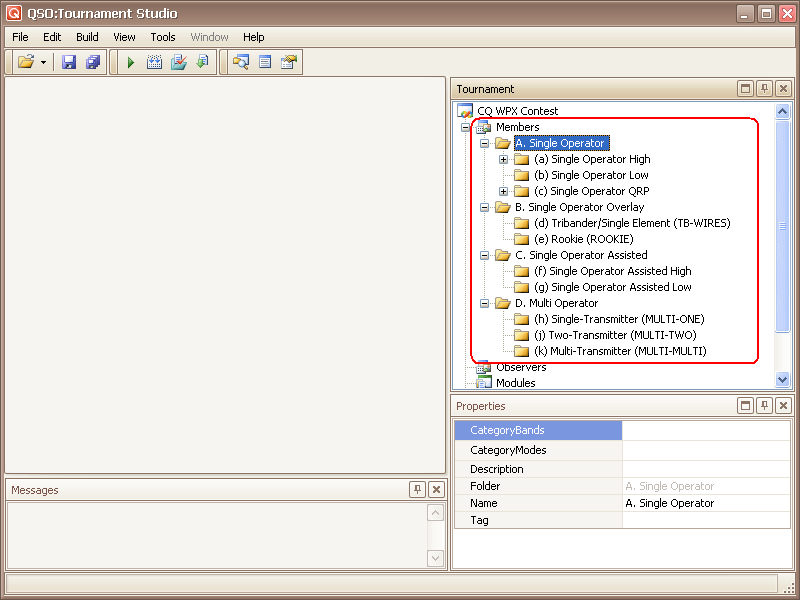 Or in one range though its file contains communications in several ranges. 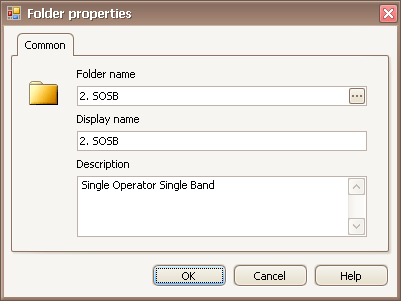 Not to clear a file of the participant manually from "superfluous" in the given folder (in the given offset) records and to provide, that the necessary records have been included in offset only (satisfying to offset conditions), it is necessary to adjust filter QSO for a folder. 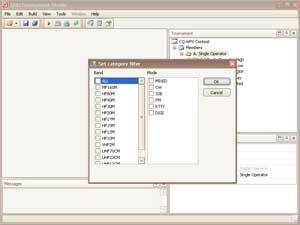 Filter QSO represents a set of the conditions defining what records QSO it is necessary to consider at processing of files from this folder. In files the records, filtrations satisfying to a condition will be processed only. 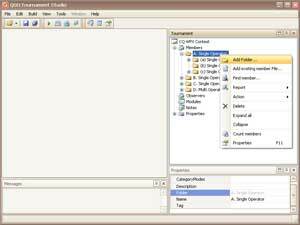 At calculation the folder filter in which directly is used only there is a file of the participant. 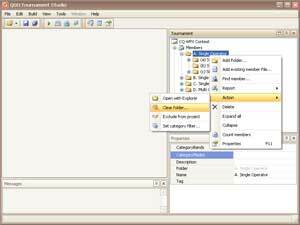 Filters of other folders, including parental, are not used. 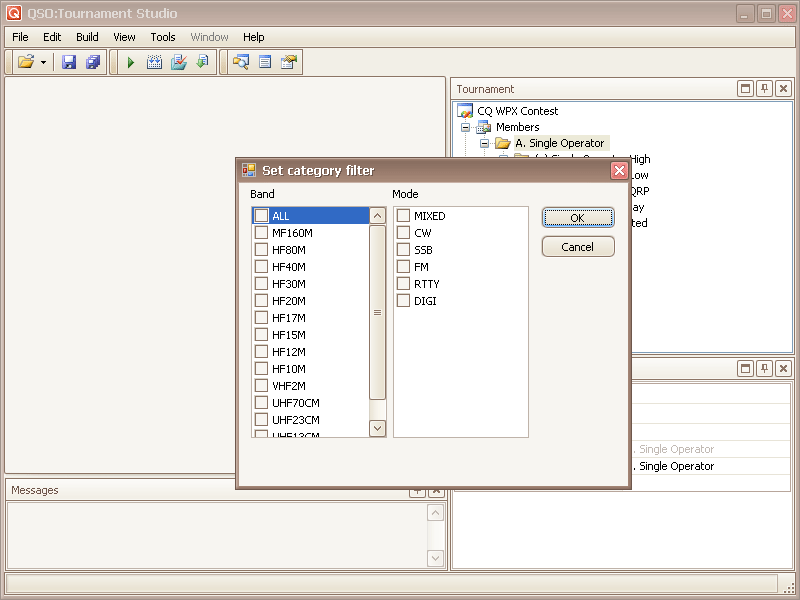 If for a folder filter QSO is not established (conditions of the filter have no values or have values "ALL, MIXED") for the files lying in this folder, in offset join all QSO. 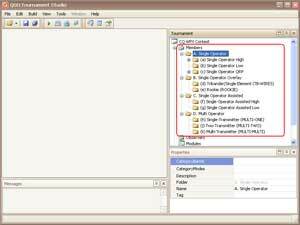 Filter QSO can be established not only for a current folder, but also for all folders enclosed in it, or for all folders of competition. Click the right button of the mouse on the necessary folder in a tournament tree, further point "Action" in the sub-menu and "Set category filter...". In the appeared form check conditions of the filter and press OK.
For the allocated folder and all enclosed in it sub-folders the chosen value of filter QSO will be established. 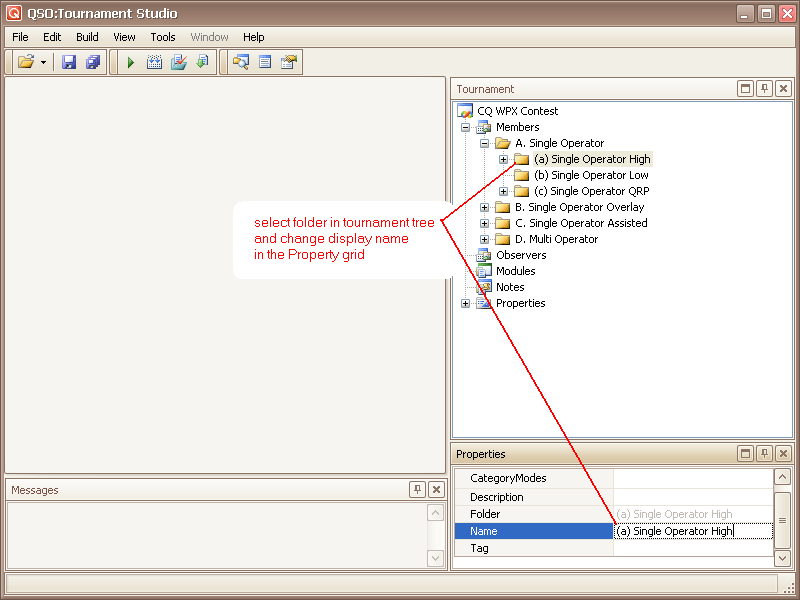 If such action to execute for node "Members" of a tournament tree, the filter will be established on all folders of competition. 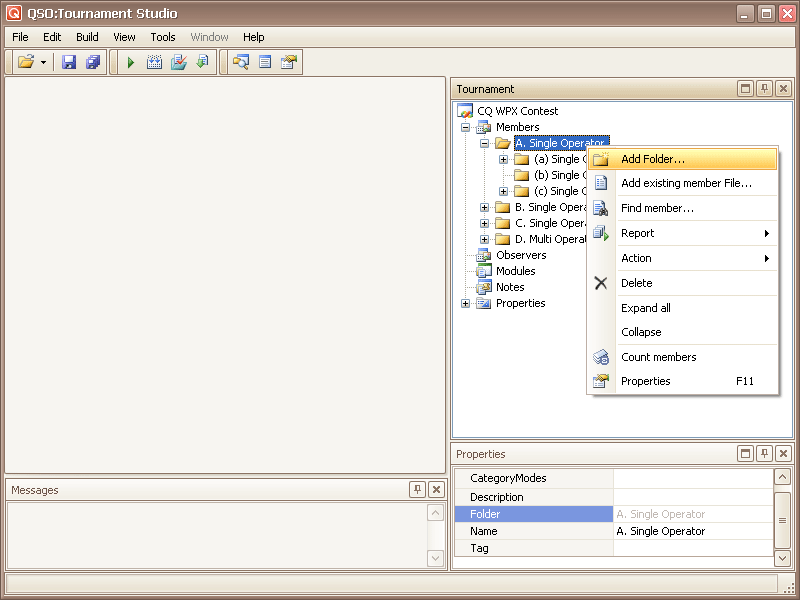 The context menu "Action" (for a folder or node "Members" of a tournament tree) contains point "Clear folder...". This action allows to remove participants from a folder and all affiliated folders, thus folders remain. Action allows to clear quickly competition, for example, after its copying in other folder on a disk. After an action choice "Clear a folder..." there will be a dialogue, offering to choose - to delete only files of participants or all contents, including the enclosed folders. The action caused for node "Members" allows to execute clearing of all competition folders.